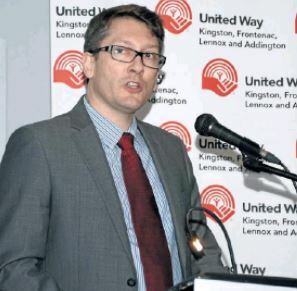 Fred Godbille, the director of DuPont Technology Centre in Kingston, has been named the 2018 United Way of Kingston, Frontenac, Lennox and Addington campaign chair. Fred Godbille has been named chair of the 2018 United Way campaign. He was introduced at the United Way’s workplace volunteer awards luncheon on Tuesday at the Ramada Inn and Conference Centre. Godbille takes over from 2017 campaign chair Patrick Murphy of Secura Financial, who oversaw a successful campaign that reached its goal of raising $3.5 million last year. Godbille is originally from Paris, France, where he studied engineering before coming to Canada in 1996. In 2002, Godbille and his family moved to Kingston and he began working at DuPont as a research scientist. He said that taking over the volunteer position is a daunting task. “It is because the past years we’ve been slowly increasing our target and I don’t want to be the one who’s not going to make that target,” Godbille, a former United Way cabinet member in the manufacturing sector, said in an interview. “But I know the community is ready and always behind the United Way. He said he’ll have to find time to run the campaign. “It’s tough to be in a corporation having to dedicate some time, but it’s important enough that we’ll do it and that’s the extra engagement I’ll put into this,” he said. “It think it’s going to be very rewarding personally, and I think there’s such a team behind it [that] a lot of the campaign happens by itself.